Are you sick, but can't find any answers why? Do you have a seemingly unconnected collection of symptoms that leave doctors guessing? Or have you been diagnosed, but found that none of the treatments seems to make a difference? You may have Lyme disease and not even know it. Known as 'the great imitator,' Lyme disease and its associated co-infections can mimic the symptoms of and often be misdiagnosed as Chronic Fatigue Syndrome, fibromyalgia, rheumatoid arthritis, lupus, multiple sclerosis, and even depression, anxiety, obsessive-compulsive disorder, and psychosis. In his landmark book, Why Can't I Get Better? : Solving the Mystery of Lyme & Chronic Disease, renowned internist and leading world expert Dr. Horowitz introduced his revolutionary plan for treating Lyme disease, and chronic diseases in general. 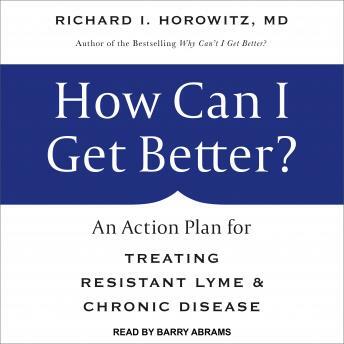 Now, in this new handbook How Can I Get Better?, Dr. Horowitz updates his research and offers a direct, actionable step-by-step plan for implementing his 16 MSIDS Diagnostic Map.